The Save A Life Golf Classic is the major fundraiser by Save A Life Group (SALG). Last Oct 6, we had our first ever event and raised $29,000. LifeShare Of The Carolinas, our beneficiary, has already developed two awareness videos with a portion of it for DMV's in their 22-county region. One video focuses on teen drivers and the second on elderly drivers. Viewing them just before the examiner asks, "Do you want to be an organ donor?" will surely result in many more yeses and more lives saved. 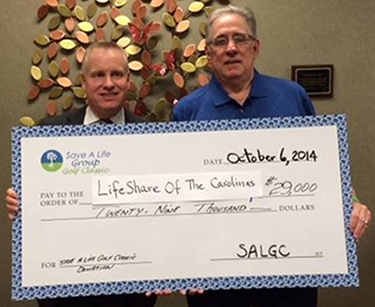 In North Carolina, the many awareness events by Donate Life, LifeShare, and groups like SALG are making a difference. Just in the past three years, the percentage of eligible donors statewide has increased from just below 49% to 53.6% based on Donate Life. More lives are being saved! Financial contributions are a main reason for this success. More folks are saying "yes" at the DMV. Please consider joining this great cause by playing, sponsoring, volunteering, or donating. If you would like to donate directly to Save A Life Group please click here. We appreciate anything you are able to give!